It's that time of year again, where I get a delicious sampling of my favorite nut and candy shop's tastiest Chanukah treats, which also means it's that time of year where you, my lovely readers -- in the United States and Israel -- get a chance to win your own Chanukah nosh from Oh!Nuts. The Chanukah gift I received was the 3-Section Ceramic Gift Tray, although the truth is that it didn't come looking like this at all! The tray wasn't ceramic, and the treats given weren't exactly what's pictured either. (I'm guessing this is because in Israel the products cannot be as standardized as they are in the U.S. where Oh!Nuts is based.) However, I was pleased with what arrived. The chocolate was divine and creamy, the nuts were salty and hit the spot when I was in need of snacking. So here's the rundown on instructions to win here on Just Call Me Chaviva. Visit the Oh!Nuts Chanukah gifts page, and choose your favorite gift. Come back here, and comment with your chosen's URL and name (and anything else you want to add). I wil pick a random winner on December 6 who will receive a $25 gift certificate to Oh!Nuts! Here are some other ways to win free goodies, too. Visit the Oh!Nuts Facebook page and post on their wall with the URL and name of your favorite Chanukah gift paired with "I am here via www.kvetchingeditor.com!" 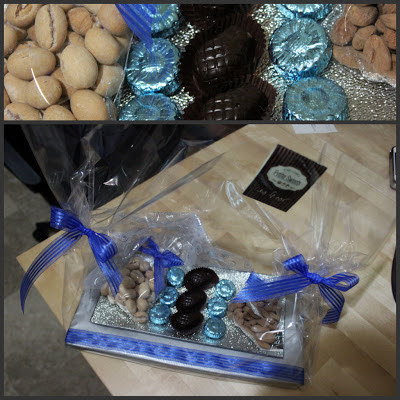 Follow @OhNuts on Twitter and be sure to tweet: "Win a free Chanukah gift from @OhNuts http://bit.ly/6nIsCi! Follow and RT to enter!" Also, head over and buy your own favorite Chanukah gift today (Monday, November 26, 2012) and use code APFS12 at checkout to receive free shipping on orders over $50! Ready, set, enter to win!